KnifeCenter is very excited about all of CRKT’ s new 2013 offerings. While at the 2013 SHOT show (Shooting Hunting and Outdoor Trade Show) we had the opportunity to see and play with many of their new items including the MJ Lerch designed Enticer. Thanks to the glass filled nylon handles, this knife is extremely light (just 2 ounces) and is a perfect light weight cutting tool for many tasks. 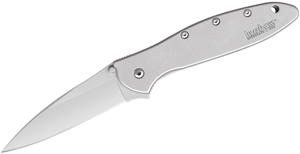 Blade opening is shockingly quick with CRKT’s patented FireSafe mechanism which, for the first time, is used with a thumb-disk to engage the mechanism. The drop point blade is 3.2” and is composed of 1.4034 steel which is known for its hardness and good corrosion resistance. 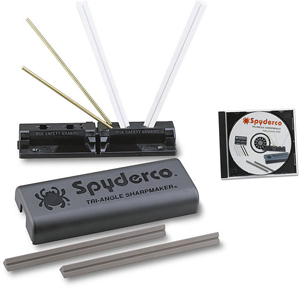 The Enticer comes in either a Satin Plain blade or a combo edge version. The Enticer is available now for pre-order here at KnifeCenter. Other new items from Columbia River Knife and Tool include the Ken Onion Redemption (described in our blog here); the Onion Para-Saw Paracord Survival Bracelet , nylon paracord that’s braided into a bracelet form—with a plastic encased, tungsten carbide coated wire saw woven into the braided cord; the Endorser, featuring a 3.1″ drop point blade and CRKT’s patended OutBurst® assisted opening system; the fixed blade Sakimori; and many other new items that can all be found here. This Columbia River Knife and Tool “First Production” fixed blade Redemption Tactical/Survival Knife definitely has an immediate WOW! factor. Here at KnifeCenter we were all impressed by the overall heft of the knife and the truly unique Ken Onion designed blade. This behemoth combat tactical weapon features G10 handles which provide for a more comfortable feel and ease of use and Includes a nylon sheath with belt loops, a leg strap, and an extra storage pocket. 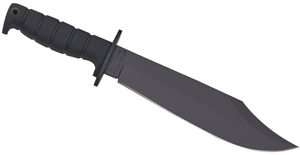 The knife is secured in a removable Kydex liner (simply unscrew one bolt) within the nylon sheath. The black plain blade features a dramatic recurve and is constructed using YK-30 high-carbon steel. Whether you’re blazing through the jungle, removing unwanted brush from the backyard, or simply wish to impress your pals with this wicked beast of a knife, the Redemption will surely fit the bill. These are sure to move quickly so get yours here ASAP at www.knifecenter.com!! Spyderco Knives creates a great new knife that works as an every day carry for everybody as well as a special tool for people who need a great knife in their every day work. This knife has a lot of “bells and whistles.” It’s lightweight, has a slim profile, opens easily and locks solidly. This is a first for Spyderco. It probably won’t be the last flipper opening knife that Spyderco Knives offers. The Southard designed blade is a long belly – that’s it and this makes for a really useful tool. The top of the blade has jimping near the handle which is great for control and then another ramp further out for when you are choked up on the knife for a more controlled and precise cutting. This pocketknife has a framelock system with a titanium side to the handle. A piece of that titanium alloy actually flexes over to lock the blade in the open position. The pocket clip sits on that side and is polished steel. The Southard flipper from Spyderco is a medium sized folding knife and you can see them at www.knifecenter.com. We all loved the Hobbit and the Lord of the Rings series of books. Then the movies came out! Years ago we sold the authentic swords and gear from the Lord of the Rings movies, but now, the first of three Hobbit movies is in theaters! We have some great items available. We have Bilbo’s sword STING and the Sting scabbard as well as several other items. See them at www.knifecenter.com. They’re great!